Bloggin' 'bout Books: TTT: Where Are They Now? 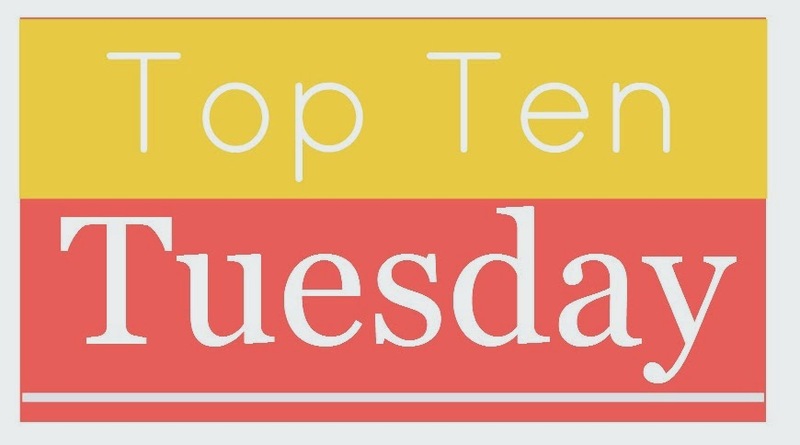 Anyway, this week's topic is: Top Ten Characters You'd Like to Check In With. Since I could only think of ones I figured would be on everyone's lists (Scout Finch, Scarlett O'Hara, etc. ), I decided to focus my list on characters whom I can check in with, but whom I've been neglecting of late. 1. 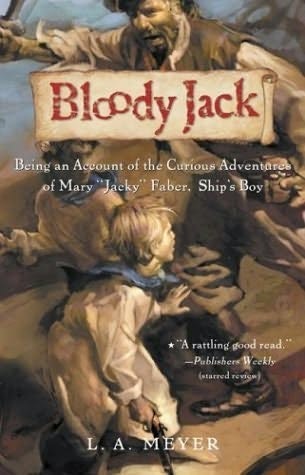 "Bloody" Jacky Faber (Bloody Jack series by L.A. Meyer)—You've heard me rave on and on about how much I love Jacky. She's a fantastic, larger-than-life heroine who makes me laugh. As much as I adore her, though, I've only read half of the books in the series. I need to pick up My Bonny Light Horseman soon and see what crazy adventure Jacky's on this time! 2. Amelia Peabody (Amelia Peabody series by Elizabeth Peters)—Amelia Peabody is more understated than Jacky Faber, but she's also a heroine who has great adventures. Her shocking actions/demeanor make me laugh. I haven't read a Peabody mystery in some time and might have to re-start the series so I can remember who's who and what's what. Or, I might just start where I left off (Book 5? Book 6?). 3. Percy Jackson (Percy Jackson series by Rick Riordan)—Percy Jackson is one of my kids' favorite heroes. I enjoyed The Lightning Thief, but never moved on with the series. I think I need to drop back in and see what the young demi-god is up to these days. 5. Mel, Jack, Preacher & Co. (Virgin River series by Robyn Carr); Hank Cooper & Co. (Thunder Point series by Robyn Carr)—I love Carr's romance novels with their small-town settings and big-hearted people. I've read over half of the former series, but only the first of the latter. I've got some catching up to do, for sure! 6. Hannah Swensen (Hannah Swensen series by Joanne Fluke)—Yes, I realize these are the silliest murder mysteries in the history of murder mysteries. I blame my friend Tara for turning me on to them. She's right, though, they're useful when you want to read a light, easy mystery that won't turn your stomach or tax your brain. Also, there are the recipes. So, yeah, I definitely need to pop back into this series to see what's going down with the cookie baker turned amateur sleuth. 7. Cammie Morgan & Co. (Gallagher Girls series by Ally Carter)—I love this outlandish, warm-hearted series. It's just fun. The girls always have something crazy going on, so visiting them is a guaranteed good time. I need to start Number Three, Don't Judge a Girl By Her Cover, soon. 8. Don Tillman & Rosie Jarman (Rosie series by Graeme Simsion)—The Rosie Project made me laugh out loud (many times) and root for this unlikely pair. I'm curious to see what happens to them next. Good thing I'm already on the library's waiting list for The Rosie Effect. 9. Odd Thomas (Odd series by Dean Koontz)—Although I was not happy with the ending of Odd Thomas, the first installment in this popular series, I enjoyed the book. Considering what happened to poor Odd in the first novel, I definitely need to check in with him and see if he's okay. 10. Ruth Galloway (Ruth Galloway series by Elly Griffiths)—Okay, so I just barely left this English archaeologist, but I'm ready for another visit to the salt marshes she loves so much. Especially since the first novel ends not in a cliffhanger, but in an intriguing twist. I definitely want to see where it leads! So, there you have it. I'm obviously horrendous at completing series. The worst thing is, I feel like I've left all these characters hanging, like they've just been suspended in time until I open their books and release them. When will I stop neglecting these poor story people? Hopefully soon. Which fictional characters have you been ignoring? Which are you still wondering about? Who would you like to catch up with? I'd love to see your TTT list. I haven't even heard of some of these! I never finished the Chronicles of Narnia series, either. I read The Magician's Nephew and The Lion, the Witch and the Wardrobe... and I might have started the next book, but I lost interest (this was many years ago). I can't even really remember what happened in the books I did read; I wouldn't even be able to name the characters! Yes, absolutely read more Ruth Galloway. I'm telling you, do it! And start again with Crocodile on a Sandbank at least. That one is so good! Virgin River series - loved it. I've only read the first book in Ally Carter's series - need to read more. Percy Jackson - loved that series. Need to read the next one and did you know that Rick Riodan is writing one that has Norse gods next? Thor, Loki, Asgaard? Just saying. Is he? Oh my goodness, I am never going to catch up on his books! Great take on this week's list! Love the Gallagher Girl Series--it took me a while to get all of them done but they were worth it! I didn't read the rest of the Chronicles of Narnia until I was an adult but I loved them when I finally got around to them. Especially The Magician's Nephew. Just don't talk to me about the last one. Not happy! I love the Joanne Fluke mysteries even though they're definitely on the fun side and I'm dying to read Ally Carter and Elly Griffith. Great list! I have the Pevensies on my list this week too. Well, specifically Susan because I'm really miffed that she didn't end up in Aslan's Country and I want to know if she's ever allowed in. I would love to check back in on Percy Jackson and Chronicles of Narnia too! I loved those series but never got around to finishing them. It would be nice to check on some of the characters I loved. Amazing list! I like your twist on today's topic. There are so many series that I need to finish. Obviously you knew I was going to push you to finish the Odd books asap. So good! If you can only finish one series in your life, it should be The Chronicles of Narnia. I didn't read it until last summer, but I loved it. I haven't gotten into Dean Koontz's Odd Thomas series, but I do love some of his other books. I don't know what it is about Odd Thomas that's a little off-putting to me. I've seen Percy Jackson floating around on the Internet, and I've been meaning to add it to my TBR list. It sounds like a pretty cool series. I put off reading ODD THOMAS for a long time because it just looked so ... odd. Lots of people recommended it to me, though, and I was actually surprised by how much I liked it. Ohh what a great list of books you've got. I totally agree with PoJ. I really have to read The Rosie Project because it's been on my TBR for quite some time now. Do not blame me for the Fluke books. They are terrible & get worse and worse. Just go to lunch with me and I'll catch you up on everything. And some of the others on your list. And you can tell me more about a few I haven't read. Next week? For sure! Any morning next week will work (I think). I'll text you. I totally agree, it would be easier to talk about all those series that, for reasons unknown, we never finished. I have problem even with the really great one, always one och two books left in to many series. Yes to Percy Jackson and Narnia! Such great series. Percy Jackson is one of my favorites and if you liked Lightning Thief, you'll love the rest! I love the Narnia series. You really should finish the series. On the Percy Jackson books, I haven't read past the first one either but I really would like to. i can't believe you haven't finished the percy jackson series yet; you totally should! it's so good! and great list!